I was wondering how long it would take the RC world to catch up with the "green" movement and the general push for more fuel-efficient and environmental friendly real cars. The New Bright ecomobile solar car claims to "run on sun" and there are no batteries you need to supply whatsoever, because most of the roof is occupied by a solar panel. 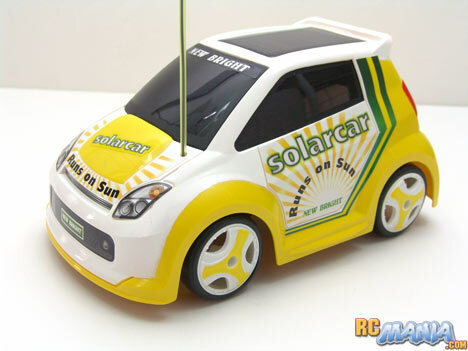 However, if you read the package carefully, you'll notice that it's not really a solar-powered car, meaning it won't go as long as the sun is out. It's solar-charged. 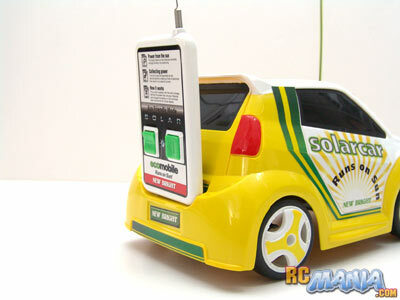 There's a regular rechargable battery in the car, the solar panel charges the battery, and the battery powers the car. I really like this idea! No batteries required ever, for anything! Just for the heck of it, I tried leaving the ecomobile out in a brightly (but artificially) lit room for several hours to see if this could charge it at all. It only ran for about 45 seconds, so that was a no-go. For a proper test, I first left it by a partially-lit window for a couple hours while I worked on some other RCs, then took it out into full bright California sunlight for 1 1/2 mid-afternoon hours, hoping this would earn me at least 5-7 minutes of runtime. Instead, all I got was 3 minutes of continuous driving on perfectly flat ground before the battery was completely dead. Well that's not good. While it was running, the ecomobile was very responsive to controls and accelerated almost instantly, but its top speed was like I'd expect from a car half its size -- slow. Maybe I got a dud here. Maybe there was an invisible cloud of gas overhead that was filtering away a lot of the sun's energy. Oh, wait, the fine print on the box does say that charging and driving times can vary depending upon the time of year (the sun is less bright in the winter), time of day (the sun is only its brightest around noon), and driving conditions (I was driving literally non-stop for those 3 sad minutes). Maybe at the right hour on the right day of the year I could have gotten 5-7 minutes of driving on a 1 1/2 hour charge. Maybe even a minute more than that. Even so, it still would have been very slow and unsatisfying, and I would really think a kid would want to play with an RC during the day, not sit around waiting for it to charge. I absolutely love the idea of the New Bright ecomobile solar car, but my real experience with it was pretty disappointing. Fortunately at $25 US, the value isn't too terrible, considering you never have to buy batteries. For someone who lives in an area that gets nonstop bright sun under a perfectly clear sky, this might be a decent summertime toy for younger kids, something to help them learn about being good to the environment. For anyone else, I'd say pass on it.